The reasons for the excessive prescription of antibiotics in the community are complex and include the lack of a precise diagnosis as to the cause of the presenting respiratory illness, perceived patient and parental preference for the receipt of an antibiotic, and a lack of appreciation of the negative impact of unnecessary prescriptions, particularly with regard to the development of resistance in the community. Fear of litigation, both consciously and unconsciously, might also be a factor. Perhaps equally important are constraints on the time available to perform a full clinical assessment and the considerable diagnostic uncertainty that arises as a consequence of overlapping clinical features between bacterial and viral infections and even non-infectious respiratory illnesses.10,11. It should be understood that the clear nasal secretions characteristic of the common cold frequently become purulent without signifying superimposed bacterial infection (Figure 2). This is a common misperception and hence, even with coughing, which is a normal accompaniment of a post-nasal drip, antibiotics are not required. 8 Patients should be advised that the average duration of the illness (before and after seeing the doctor) is in the region of 10-11 days. 17. Obtaining nasal swabs for culture is strongly discouraged even if the cough is persistent, and is particularly wasteful in resource-challenged, low- and middle-income countries (LMICs). Only symptomatic treatment should be provided, which may include analgesics, such as paracetamol (for relief of fever, headache or sinus discomfort). Aspirin should be avoided in children less than 18 years of age because of the risk of Reyes disease. In those ≥12 years of age, oral or topical decongestants may relieve rhinorrhoea and nasal congestion; however these should not be used for more than 5 days as longer durations may lead to rebound congestion known as rhinitis medicamentosa. Early use of a nasal steroid may reduce the duration of the post nasal drip-induced cough. Clinically it can be difficult to differentiate acute bronchitis from other conditions that may present with cough.18 The major differential diagnosis is community acquired pneumonia (CAP) which does require antibiotics as depicted in Figure 3. Data is limited regarding the management of acute bronchitis in children. Most would regard it as an extension of a non-specific viral URTI and no laboratory testing would be advised. Microscopy, culture and sensitivity (MC&S) on sputum specimens is strongly discouraged, as antibiotics may inappropriately be prescribed for growth of colonisers or normal flora. Perhaps the most important feature of a more severe condition requiring a CXR is tachypnoea. Antibiotics do not alter the natural course of acute bronchitis and should not be prescribed unless co-morbid risk factors are present,18 as depicted in Figure 3. Despite most cases being viral in origin, physicians in the United States continue to prescribe antibiotics to adults with this diagnosis despite clear-cut guideline recommendations to the contrary.16 In fact, despite significant interventions, including guidelines, quality measures, and more than 15 years of educational effort by the Centres for Disease Control and Prevention (CDC), the antibiotic prescribing rates for acute bronchitis, which should be zero, have remained at 71% and has even increased between the periods 2006 to 2010.20. Management should include advice to the patient as to the benign nature and course of the condition, with the potential for symptom resolution to take up to 3 weeks, together with a nasal steroid and with instructions for the patient to return should symptoms fail to resolve or if a pyrexia, pleuritic chest pain or haemoptysis ensue. A macrolide antibiotic should be prescribed for confirmed Bordetella pertussis infections and although it has limited symptomatic effect, it does reduce the risk of transmission. 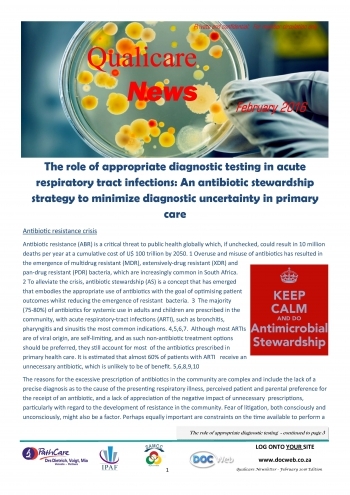 It is important to note that a delay in antibiotic prescription pending availability of culture results does not reduce efficacy in the prevention of acute rheumatic fever and as such a delayed antibiotic prescription strategy is advised for all patients where a throat swab has been sent for MC&S. However, throat swabs for confirmation of GABHS may not be feasible in many SA settings owing to increased direct and indirect financial costs and the need for additional healthcare visits. In such cases, empiric antibiotic therapy is advised for all patients aged 3-21 years that fit the clinical prediction rules. Generally speaking, the mainstay of the management of acute pharyngitis is symptomatic which includes adequate analgesia and antipyretics. Correct clinical diagnosis of AOM is the key to reduce overall antibiotic prescribing for this very common condition. Approximately 75% of children have had at least one episode by 3 years of age.8 Time and clinical acumen is required to visualise the eardrum. Symptom presentation varies with age and because typical symptoms overlap with other conditions, a clinical history alone is not sufficient to predict whether AOM is present or not. To confirm the diagnosis, inflammation of the eardrum and a middle ear effusion i.e. fullness, bulging, cloudiness and redness of the tympanic membrane (TM), must be identified (Figure 5). Although redness of the TM is an early sign of otitis media, alone it is not diagnostic as there are numerous other causes which include crying, otitis externa, myringitis and barotrauma.8 As a consequence, AOM is frequently mis- or over-diagnosed. Although clear visualization of the TM is difficult at times, and because AOM is typically self-limiting, a high degree of diagnostic certainty is essential to minimize antibiotic overuse. Previous studies have shown that with correct diagnosis, unnecessary antibiotic use can be reduced by up to 66%. 31 Pneumotoscopy and tympanometry are very useful in determining the presence of a middle ear effusion. Routine tympanocentesis on children with uncomplicated otitis is not feasible because of ethical and resource related considerations. Swabs and/or aspirations of otorrhoea (clear or purulent secretions) from a fresh tympanic perforation in patients without prior exposure to antibiotics, that is neither recurring nor chronic, are also not routinely advised. However, with cases of AOM that closely follows swimming in children with perforations or Grommets, a MC&S is very useful in excluding Pseudomonas aeruginosa which might be critical. Of note, CRP is unhelpful in determining whether antibacterial therapy can be withheld. As AOM is often viral in aetiology (50% of cases), and with most bacterial cases (commonly Streptococcus pneumoniae, Haemophilus influenzae) resolving spontaneously, treatment of pain is the most critical aspect of the management of AOM. Antibiotics may be deferred for 48 hours in children ≥2 years of age while symptomatic therapy is administered (particularly where good follow-up is possible), if there is unilateral involvement and if the disease is not severe.8,32 (Figure 5). Antibiotic prophylaxis in recurrent cases is of no value. Attempts to establish an aetiological diagnosis of sinusitis are typically reserved for patients who have not responded to conventional medical treatment within 48-72 hours, in immuno-compromised patients and in the presence of complications. Sinus puncture and aspiration are the reference standard for a bacteriologic diagnosis of ABRS. As most studies have shown poor correlation between nose and throat cultures with maxillary sinus aspirates, nasal or nasopharyngeal swabs are not recommended. A recent meta-analysis of treatment outcomes for ABRS has shown marginal benefit of antibiotics over placebo. 33 Overall, the number needed to treat for one adult to benefit is 13 (95% CI 9 - 22). Neither topical nor oral decongestants and/or antihistamines are recommended as adjunctive treatment whereas both intranasal irrigation with either physiologic or hypertonic saline and intranasal corticosteroids are recommended, the latter primarily in patients with allergic rhinitis. With regard to chronic obstructive pulmonary disease (COPD), there really are two situations in which antibiotics may be used. The first is for the treatment of acute exacerbations of COPD (AECOPD), which is the focus of this section. The second is the long-term antibiotic use for COPD patients who continue to have recurrent exacerbations despite optimal COPD treatment; description of this is beyond the scope of this document. Most definitions of CAP include symptoms of a LRTI (productive cough, pleuritic pain and dyspnoea), focal chest signs (dullness to percussion, bronchial breathing and crackles), as well as systemic features such as tachypnoea, tachycardia and a temperature of ≥38°C. 43 These features are however non-specific and can be present in other infections, such as acute bronchitis, acute sinusitis and non-infectious conditions although tachypnoea and tachycardia are uncommon. Symptoms and signs are also often less pronounced in elderly patients.44 If there is doubt as to the diagnosis,45 POCT of CRP may be helpful and is discussed below and depicted in Figure 3. CRP between 20 -100mg/L: watchful waiting approach is recommended, where antibiotic prescription is provided only if the clinical condition deteriorates and if co-morbid risk factors are present. These would include age < 3 months or > 75 years: in children, cardiovascular and pulmonary conditions (except asthma); in adults: heart failure, severe COPD, diabetes mellitus (especially with use of insulin), neurological conditions, severe renal insufficiency or immune-compromise. It is also useful to utilise CRP to identify patients presenting with AECOPD most likely to benefit from antibiotics. In one study of AECOPD comparing amoxicillin/clavulanate with placebo the best CRP cut-off for predicting clinical failure in the placebo arm was 40 mg/L, with an area under the curve of 0.732 (95% confidence interval, 0.614-0.851).42 (Figure 8). The consequences of ABR in terms of patient outcomes and economic impact are not a distant threat, but are being played out ‘here and now’. In South Africa, increasing levels of MDR, XDR and PDR organisms have been spawned by rampant over- and incorrect use of antibiotics. 1,58. As such, antibiotics should be seen as a precious resource and the prescribing physician, particularly the GP, the guardians of this resource. Antibiotic stewardship requires a collaborative effort on the part of policymakers, healthcare providers, health-care insurance companies and patients. Besides the urgent need for ABS governance in primary care including optimal process and outcome measures, a drastic behavioural change is required by both doctors and patients with more emphasis on non-antibiotic treatment options, particularly in the outpatient setting. To achieve this, primary care physicians need to assess their patient’s clinical presentation carefully, attempt to follow simple frameworks for clinical decision-making regarding antibiotic use and where applicable, the appropriate use of POCT testing of biomarkers and cultures in order to minimise diagnostic uncertainty. 59 Understanding their patient’s expectations along with improved communication of antibiotic resistance principles, education, and empowerment are key to reducing antibiotic use in the outpatient setting. Disclaimer: This review clinical practice guideline is not intended as a sole source of guidance in the management of patients with conditions described in this paper. Rather, it is intended to assist clinicians in decision-making. It is not intended to replace clinical judgment or establish a protocol for the care of all patients with the conditions described. These recommendations may not provide the only appropriate approach to the management of patients with such conditions. Source: Brink AJ, van Wyk J, Moodley M, Corcoran C, Ekermans P, Nutt L, Boyles T, Mendelson M, Perovic O, Feldman C, Richards GA.